Our focus has always been Innovation. Back in 1995 we were the first online RV classified site. We followed that by being the first to offer imports and exports to other classifieds. Each and every year since, we continually develop new tools with the same mission: How can we leverage technology to help you grow your business? At NetSource Media we don't force you into long-term contracts or hassle you when you have a problem. Why? It's simple actually, we want every client to be a "Raving Fan". Thus, when you call NetSource Media a person will answer the phone, not a machine. Just ask for us by name - we're happy to serve you. The base of your web marketing starts with your Search Engine Friendly website which includes individual keyword research, search engine accessible sitemaps, manual search engine submissions, RSS feed, secure (SSL) delivery, and mobile responsive display. Choose an EZ-Site Theme, or our award-winning designers will develop a Custom Design for you! RVUSA.com is a major resource for RV Buyers with an average of 7 MILLION unit detail views each month by actual RV buyers. Gain valuable exposure and credibility through featured listings and advertisements on RVUSA.com. Our portal site acts like a highway billboard for all of our website visitors to learn about your dealership and inventory. Whether you’re an RV Dealer, Supplier, Manufacturer or Service Provider to the industry, we’ve got a solution that’s right for you! 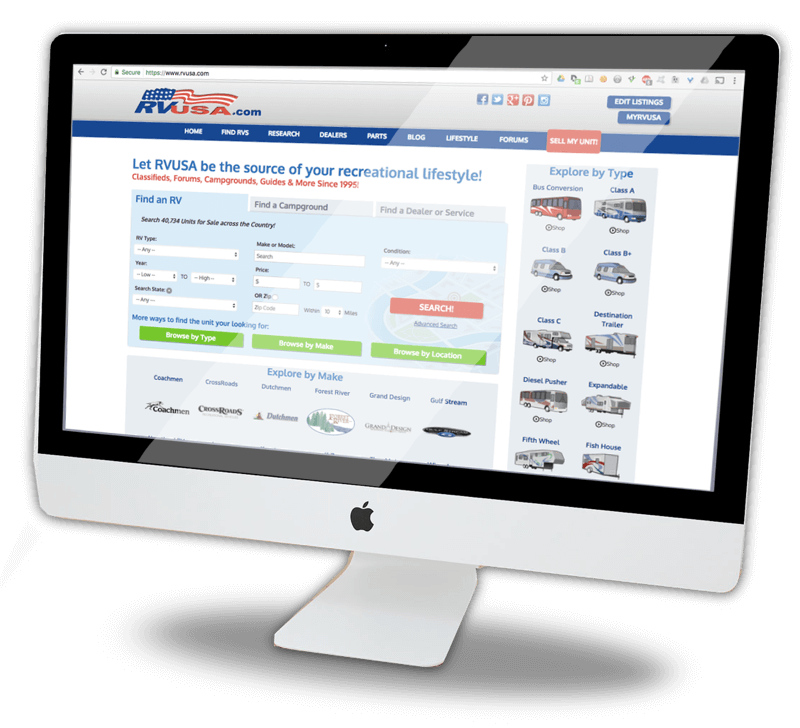 Request a Free RV Dealer Website Demo!